Yarn measurement can be a bit of a grey area, with mystery numbers flying around and unidentifiable units. Let’s clear everything up here! English cotton count (ne) is often used for cotton and cellulose yarns like SeaCell, Tencel, and viscoses. Metric (nm) is more often used for silks and silk blends though it can and should (!!) be used for everything. Linen is usually measured in NeL/lea. When you buy yarns for weaving, they are very likely to give a yarn count in one of these (or other similar) measurement systems. That yarn count figure is made up of three pieces of information. The yarn count of each ply tells you what the length per weight would be if the yarn were only a single ply. The number of plies tells you how many individual spun strands make up the yarn. This is commonly a 1 or 2, for either an unplied or a two ply yarn but can be more. 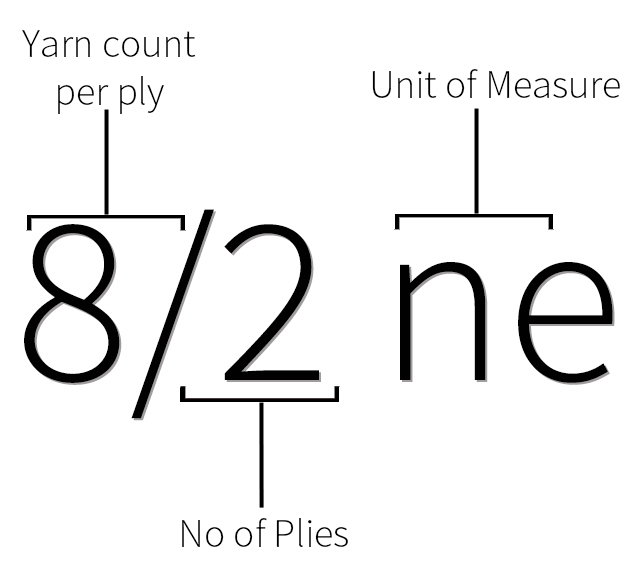 The unit of measure says what measurement system the yarn count is given in. Now that we know how to read that number, how do we translate it? No matter which of these above yarn count units we’re using, the calculation is essentially the same. In order to do the calculation we have to first take the yarn count and put it into a single number, the final yarn count. Luckily, this is very easy to do! Just divide. 8/2=4. As an example, the popular 8/2ne cotton has a final yarn count of 4ne. What about 20/2nm silk? 20/2=10. That gives a final yarn count of 10nm. One tricky exception is when a yarn has been uptwisted. For example: 3x16/2ne. That means that three strands of two ply 16ne have been plied together. That means that this really is 16/6ne, because there are six plies total. The reason it’s written as 3x16/2ne is to show that it’s been uptwisted. In this case the yarn will have a final yarn count of 16/6=2.67ne. The final yarn count tells us the total length per weight of the yarn. Once we have that number, we can use the key below to multiply and get the total number. Now you know what the conversions mean, how to use them, how to translate between them, and why it’s important to always use the units in yarn counts! Good luck and I hope this was helpful!